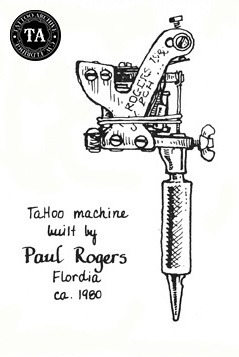 Paul Rogers (1905-1990) had a long and varied tattoo career, starting with a mail order kit from E. J. Miller in 1928. In the late 1940s, Paul went on to work with Capt. Coleman, one of the greats. 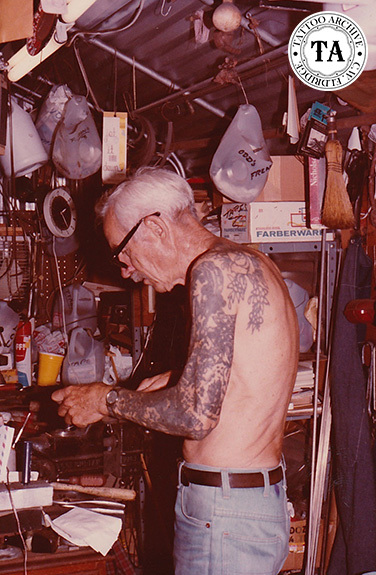 By the 1970s he was building machines for some of the best-known tattooists of the era. 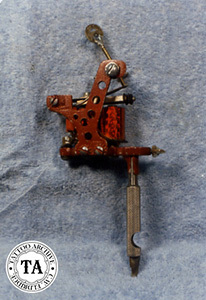 Paul made his name by building great tattoo machines, and this is what he is best known for today. Most machine builders and suppliers working today have at least one Paul Rogers style machine that they sell. The 1960's found Paul Rogers and his wife Helen settling into their new trailer home on Shetter Avenue in Jacksonville, Florida. 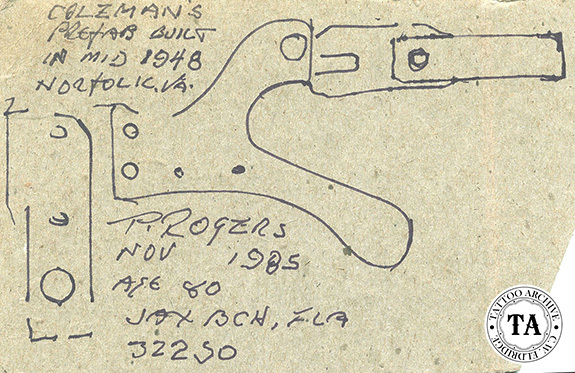 He had been working in Jacksonville, Florida for several years with Bill Williamson, and when Williamson died in 1964 Paul took over his shop. After a run-in with some local tough guys around 1970 Paul closed that shop and started doing more machine building at home. Paul and Helen and that little trailer saw an endless stream of visitors. Here Paul could spend more time with the machine work that he loved so much. Paul had old-time tattoo customers that he tattooed at his trailer and many of the visiting masses would also want to take home a piece from "Pop". But his machine work took center stage. Paul spent countless hours in that little 12x12 tin shed, affectionately called the "Iron Factory", building unstylish but dependable machines. The name "Iron Factory" came about because Paul referred to his machines as "Irons". These "Irons" went into the hands of some of the best tattooists in the world: D.E. Hardy, Greg Irons, Martin Robson, Dale Grande, John Lenz, Greg Skibo, George Bone, Dennis Cockell, Jack Rudy, Kari Barba, Juli Moon, Tom Beasley and Bob Roberts, to name just a few. Today Paul's machines are in great demand and command some of the highest prices paid for tattooing machines. The "Iron Factory" was a portable building set on the side of Paul's lot on Shetter Avenue. It was not insulated so it was hot in the summer time and cold in the winter, but this never kept Paul away. It was so filled with workbenches that there was really no place to sit down, there was barely room to stand. Paul kept a couple of wooden stools around, mostly for his visitors. He would spend most of his working hours in the "Iron Factory" standing at those workbenches. Paul was from the old school so his machines were built with hand tools. The only power tools I remember seeing were a drill press and a grinder. Machine heads from around the world would gather at that small shed and hang on every word as they watched Paul build his machines, hoping to gain some of Paul's understanding of this device. If they were game Paul would put them to work building their own machine with him guiding each step. Want to learn more about Paul Rogers' machines? Check out Paul Rogers Machine Booklet in our online store.